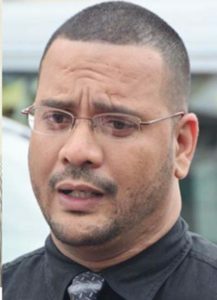 James Singh has received notification that he will no longer be the Head of the country’s premier illicit drug fighting agency, the Customs Anti Narcotics Unit (CANU). Singh told Kaieteur News that he was notified by the Public Security Minister, Khemraj Ramjattan, that his contract would be coming to an end. No letter of termination, he said, was provided to him. Singh said that he was told that his termination stemmed from a presidential-ordered Commission of Inquiry (CoI) to inquire into the circumstances surrounding the entry into, the interception, detention and subsequent release of an unnamed private maritime vessel in the sea space of the territory of Guyana. The vessel was spotted in Guyana’s waters off the Corentyne Coast moving north between February 11 and February 14, 2017. While in the vicinity of Shell Beach, it was intercepted by local authorities, and brought into the Waini River and searched. Though narcotics were not found on the vessel, which was subsequently released, it is suspected that the vessel is linked to a massive high seas drug bust, which ensnared four Guyanese nationals and netted cocaine worth US$71.7M, some 70 nautical miles north of Suriname in international waters. The Commission was asked to report the findings and recommendations to the President, who is the Head of the National Security Committee. The State Minister Joseph Harmon, told media operatives during the post-Cabinet press briefings yesterday at the Ministry of the Presidency, that the Head of State would have given Ramjattan some “clear guidance” in implementing the recommendations of the CoI. He said when quizzed, that Ramjattan would have received guidance on whether Singh should continue to sit at the helm of the agency. Singh is currently on a 72-day administrative leave which is expected to expire next month. His contract expires in 2021. The commissioners of the COI were retired Brigadier Bruce Lovell; Ministry of the Presidency official, Christine Bailey; and retired Assistant Commissioner of Police, Winston Cosbert.